The Therapeutic Ambulatory Orthotic System (TAOS) is designed to aid the individual with neuromotor impairments, including cerebral palsy encouraging upright hands free standing or ambulation. The TAOS has two parts, an Orthotic and a Mobility Base. These two components work together to provide a unique therapy tool, as well as expansion of the child’s mobility. The system has a sit-to-stand and “easy dock” system for joining the orthotic to the Mobility Base. This feature makes the system easier to get into particularly with larger children. The Mobility Base comes in three sections with simple quick-release levers. This enables breakdown within a short period of timeand will fgit into even the compact car trunk. Reassembly takes very little time, as well. 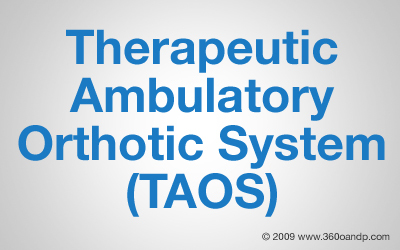 Benefits from the use of the TAOS are numerous. § Provides a safe upright environment for a variety of activities requiring standing or ambulation. § Provides a greater degree of independence and builds self esteem with newfound skills and abilities. § Permits mobility in a hands free environmentenabling the child to engage in activitires that require mobility and the use of their hands. § Provides a fantastic tool for your therapist acting as another “set of hands” supporting your child so the child can more effectively concentrate on the specific area of therapy needed. § According to parents and therapists, children utilizing this type of system see improvements in range of motion, bladder and bowel control, respiratory health, cardiovascular health, overall strength and trunk control. Use according to your physician, orthotist and physical therapist’s instructions. The wheeled base provides a means to support the child in an upright position and has a unique and simple “docking” system that quickly and easily allows the orthotic to securely mount to it. Specific instructions as to care will be provided by your certified orthotist and physical therapist.